An image of a rosehip neuron (top) and a connecting pyramidal cell (bottom). 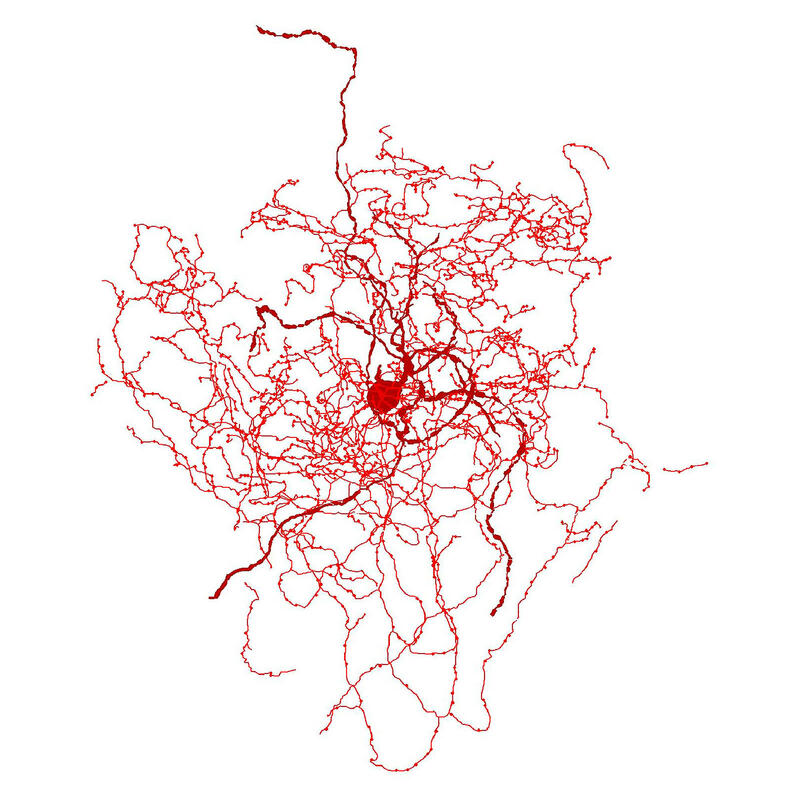 A digital reconstruction of a rosehip neuron. "It may be that in order to fully understand psychiatric disorders, we need to get access to these special types of neurons that exist only in humans," says Joshua Gordon, director of the National Institute of Mental Health, which helped fund the research. Researchers have suggested several other brain cells that might be unique to humans. But these cells have either been found in other species, or the evidence for them has been less convincing. It is still possible that these newly identified neurons will also be found the brains of primates like monkeys or chimps, Lein says. The brain cells have been named "rose hip neurons" by a team at the University of Szeged in Hungary, which played a key role in the discovery. A scientist named Gábor Tamás and members of his lab were studying brain cells called inhibitory neurons, which act like the brakes in a car. They tell other brain cells when to slow down. Tamas was recording electrical signals from inhibitory neurons taken from the cortex of two men who had died. "In the course of doing these recordings, he started to notice a very distinctive type of cell that, to him, had the shape of a rose after the petals have fallen off," Lein says. "So he called them the rose hip cell." By chance, scientists at the Allen Institute had also identified these cells using an entirely different approach, a new technique that allowed them to detect the genes that are switched on in human brain cells. So the researchers combined what they had learned and confirmed that rose hip cells were a distinct subtype of inhibitory neurons. The finding challenges earlier evidence that the human brain is merely bigger and more sophisticated than a mouse brain. At some point, humans acquired at least one kind of brain cell that a mouse doesn't have. Scientists aren't sure exactly what rose hip cells do, though they appear to be involved in the controlling the flow of information in specific areas of the brain. 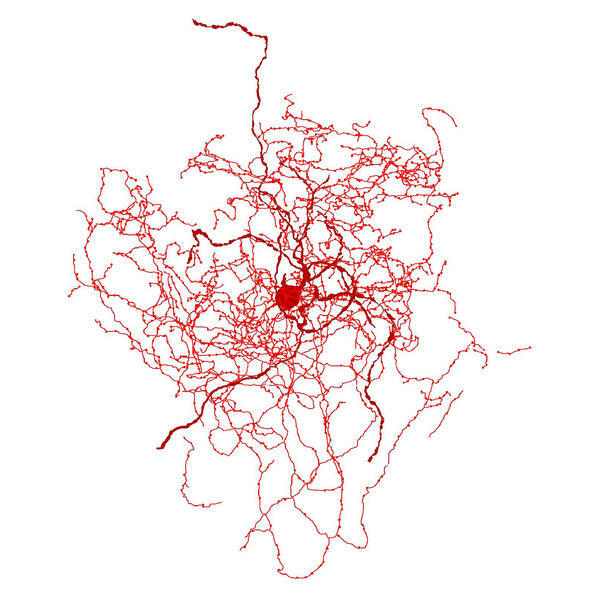 But regardless of their precise function, the discovery of rose hip neurons has implications for brain research. For one thing, "it throws some doubt on the ability to use the mouse to study certain elements of human function and disease," Lein says. 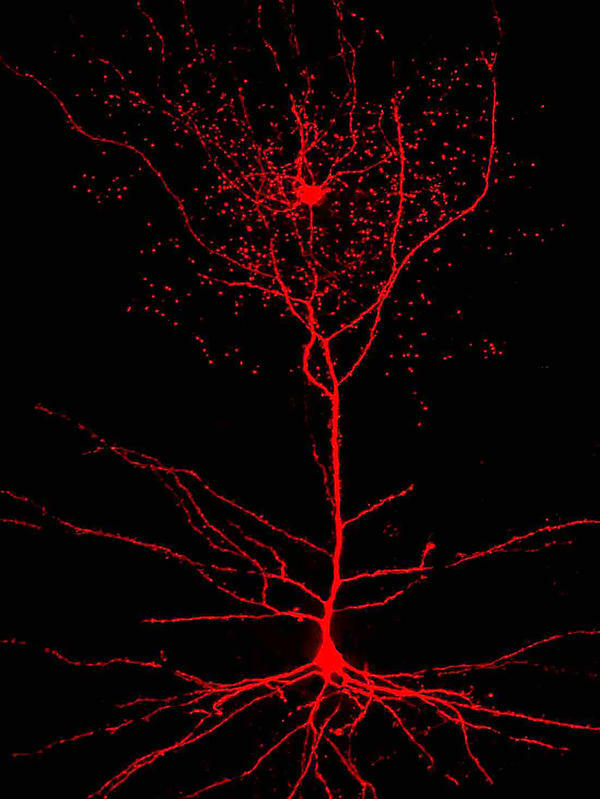 And because rose hip neurons are a type of inhibitory neuron, they could play a role in mental illness, he says. "These types of cells [inhibitory neurons] are extremely important," he says. And when there's dysfunction in them, he says, that can "directly be linked to different types of neuropsychiatric disease, like schizophrenia." The identification of rose hip neurons is part of a much larger effort by the National Institutes of Health to identify every type of cell found in the brains of mice, monkeys and people. It is also part of the federal BRAIN Initiative announced by President Barack Obama in 2013. These initiatives are taking advantage of new technologies that are likely to reveal other brain cells that exist in people but not animals, Gordon says.